Caflon is No. 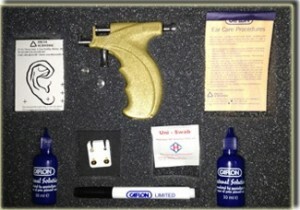 1 – For 25 years, Caflon Ltd., a British based company have been the undisputed leader in the manufacture and distribution of high quality ear piercing equipment. Caflon`s success lies in the quality of its product quality as well as the professionalism of its workforce. 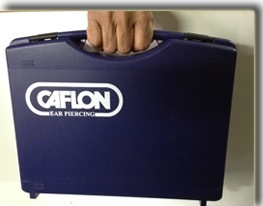 Caflon means convenience – It is quick, easy-to-use, accurate and makes ear piercing almost painless. While its precision engineering ensures complete reliability. 10 year guarantee – The Caflon instrument is guaranteed for 10 years against any malfunction. Trendy ear studs from Caflon – Choose from a range of ear studs. These include several different shapes/stones. From simple gold plated ear studs to dazzling zirconia. All precision turned on Swiss Escomatic machines, made of 303S31 steel and available in 24 carat gold plate. Approved by British Health Authority – The Caflon ear piercing instrument is one of the best available today. Caflon ear studs are non-allergenic, pre-sterilised and come in individual blister packs. Ear piercing guidelines are available here. In India, Delta Scientific are the sole distributors of Caflon equipment. They also cater to the needs of Bangladesh, Pakistan, Nepal and Bhutan.